A short standoff between police and protesters at a new opposition camp in central Moscow has resulted in the arrests of about 30 activists as they tried to prevent police buses from taking away fellow activists who’d already been arrested. ­The new site consists of about 400 people. Some activists were giving out food and drinks to those already camped there when police arrived and ordered them to stop, saying their actions were illegal. The police then confiscated boxes of food supplies before making several arrests, causing anger among the demonstrators. The tension increased as demonstrators prevented police buses carrying those detained from leaving the park, saying the arrests had been made without reason. Some protesters partly blocked the area of the Garden Ring, one of Moscow’s busiest roads, forming a human-shield to prevent the buses from leaving. Activists also broke a side-view mirror off one of the vehicles and replaced it with white balloons. As a result, up to 30 protesters, including Ilya Yashin, one of the leaders of the Solidarity movement, were detained, Itar-Tass news agency reports. However, some politicians who were present at the time managed, together with the police, to calm the protesters and stabilize the situation. Protesters have returned to the camp and the police cordon between the park and the Garden Ring has been re-established. The Duma deputy Ilya Ponomorev, a member of Fair Russia party, called for activists to leave the camp, saying they will have a chance to gather at any place in Moscow and coordinate the gathering via the Internet. 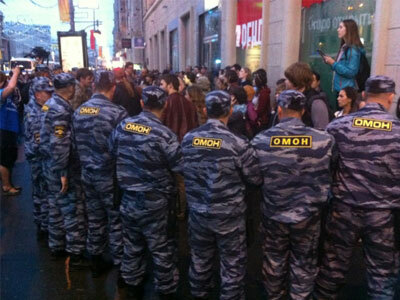 The camp is the latest of Moscow’s “popular promenades”, which have been going on since the morning of May 8. It all started at Kitai-Gorod, where the first attempt to set up a camp was made. 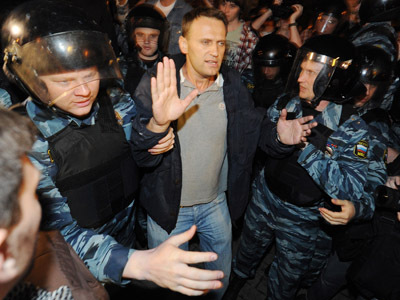 However, police forced protesters to clear the square, arresting the movement’s “founding father” the blogger Aleksey Navalny . People relocated to nearby Chistye Prudy, the cradle of anti-government demonstrations in Moscow. Shortly afterwards the peaceful sit-in and lie-in demo was again dispersed. Rallies continued throughout Moscow the next day with people moving from one boulevard to another to avoid being detained by police. However, in a few days they were again back in the Chistye Prudy area and remained there at a camp dubbed “Occupy Abai” after the Kazakh poet and philosopher Abai Qunanbaiuli (a monument to Abai Qunanbaiuli is set there). The protesters were forced to relocate one more time, to their current spot, following a court order to clear the Chistye Prudy area by noon May 16.